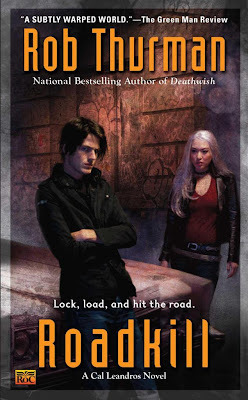 Another lovely Chris McGrath cover for Roadkill by Rob Thurman, the fifth book in the Cal Leandros series. Due for a March 2, 2010 release. No blurb available that I could find at this time. Instead go read Robyn's post about the cover title, model and more. Another great cover! I'll head over to peek at the info. It is indeed Dottie. The Cal series covers are terrific. Thanks for that cover! I *love* Rob Thurman's series! This is one of those series' that when I see a new book coming out I literally flap my hands in excitement. Love her! Thanks for showcasing this, Doug! I love this series, and I love Chris McGrath's cover art. Another winner! Can't wait for this one to be released. Karen I still haven't had a chance to read the last one and the next one's on the way. Sigh. 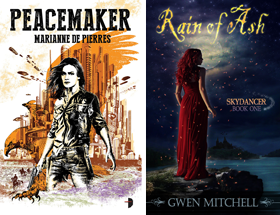 Renee interesting how Chris McGrath covers and good writers and series seem to go together. Can't think of any that I dislike. Must e a lucky charm.